Have you ever had a notice from Code Compliance on your property? Or the dreaded red ticket? After hearing stories from a couple of members, we took a brief tour of the system to understand how the process works. Code Compliance is a division of the Department of Development Services, or DSD. They’re charged with enforcing existing ordinances, including permitted uses and appearance of property. They can act in response to complaints or proactively, as the Field Enforcement Officers drive through their assigned areas. Some offenses, like parking a car in the front yard, get a no-warning ticket. Others, like tall grass, get a warning or notice. The officer takes a photo of the offending condition. For example, grass over 12” is outlawed. The photo will show a ruler next to the grass. Here’s a City website describing the process: https://www.sanantonio.gov/CES/Services/Violation-Notice You’re advised to contact the Field Enforcement Officer listed on the notice as soon as possible. Presumably, if you are responsive, your case might go better. You can also ask to see the evidence they collected. Ten days after the notice, there is a re-inspection. 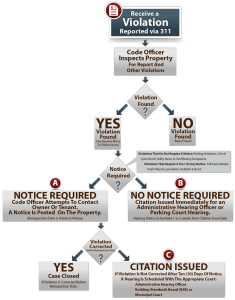 If the problem has not been corrected, a citation (ticket) is issued. The first ticket on a property is for $300, the second is $600, and the third is $1000. The photo method is also used on the follow-up visit, to show that the problem was or was not corrected. So what happens if you don’t get the condition taken care of in time, and you get that ticket? You’ll go to the Frank Wing Municipal Court Building, 401. S Frio, Courtroom 3, a civil (not criminal) court. The ticket will tell you what date and time to appear. Code Compliance cases are heard only on Monday and Tuesday. There are several dockets during the day, 9 a.m. and 1 p.m. being the busiest. Two judges share the duty. The first time your name is called, you’ll go outside with a code compliance officer to discuss your case and negotiate a plea deal, possibly negotiating the fine downward. Then back in the courtroom, you’ll be called to the bench to discuss the disposition of your case with the judge. Then you go to the cashier and pay the resulting fine. We were told that a complaint will address only one section of the code, and is evidence based, so you won’t get it set aside in this negotiation. You do have the right to request a trial or to appeal, but the court cost if you lose is double the original fine. Q: What if someone says they saw a rodent, but you don’t see any when you go to investigate? A: It’s not about the rodent, it’s about the conditions that would attract rodents, and those are documented photographically. Bags of trash, piles of wood or brush, things like that. In other words, if they make a mistake—which is unlikely, with their “evidence based” approach, they can drop the case. Our takeaway is that you’re very unlikely to prevail, so try not to get to the ticket stage. Do you have a City of San Antonio Code Compliance story related to growing or selling food or native plants, composting, or related activity? Tell us in the comments, or send an email to info@foodpolicysa.org. Donations are welcome and aid in furthering the organization’s mission.